PC gamers are hopping mad that the indie hit Terraria is coming to consoles. Released back in May 2011, the action-adventure-RPG Terraria was a pretty big hit as far as indie PC games go, topping the Steam sales charts with roughly 200,000 copies sold during its first week of release and earning a cool $2 million along the way. Re-logic, the studio behind the game, announced in February 2012 that after one final bug fix, development of the game would cease; creator Andrew Spinks said he had a new son on the way, and that he wanted to spend some time "recharging and bettering myself as both a programmer and game designer." It was a bit of a surprise, then, but also cause for much joy when Spinks said in July that he had a "pretty big Terraria-related announcement" coming in the near future; and the announcement itself - that Terraria is "coming soon" to Xbox Live and the PlayStation Network - was an even bigger surprise, but it's safe to say that the "joy" part of the equation is out the window. The Terraria Facebook page is currently not a happy place as PC gamers, once again demonstrating why they are the respected and even beloved elite of the videogaming community, vent their rage over what they seem to see as a betrayal of... well, something. Most of the comments can't be printed here (it gets a little swear-y), but the majority of the anger seems to be directed at the developer's decision to release a "cash grab" console version rather than a proper update for the PC. Fueling that rage is the fact that the Xbox 360 and PlayStation 3 editions will feature extra content, but there's been no indication that the new material, whatever it may be, will be released for the PC. There has been some pushback from gamers who think the outraged reaction has gone too far, and even one or two who thank the developers for providing dozens or even hundreds of hours of gameplay for a measly ten bucks, but overall, doom, gloom and idiot rage rule the roost. It's quite a contrast from yesterday's tease of today's announcement, which was followed by hundreds of messages of happiness, appreciation and love from fans. 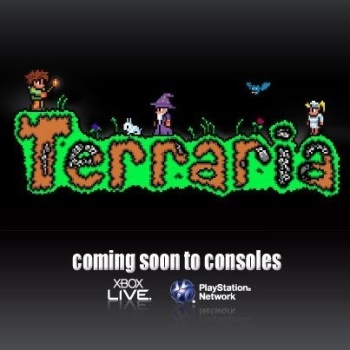 The 360 and PS3 versions of Terraria are currently slated to arrive in early 2013. More information can be found on the official Terraria forums or the Terraria Facebook page - but please, try not to embarrass yourself.